Bangalore to Ooty Tour Package-5D4N 5D4N starting from 36000/-. Destination Include Bangalore, Ooty, Mysore. Bangalore to Ooty Tour Package includes 3-star accommodations, Breakfast, Sightseeing. The capital of Karnataka and the 3rd most populated city in India, Bangalore is often known by its nickname the silicon valley of India due to it being a major IT exporter in India. The city is now known by the Kannada name ‘Bengaluru’ which means ‘The City of Guards’. There are, however, various translations of this word. The town is famous for its various attractions which include both modern and historical place to visit. 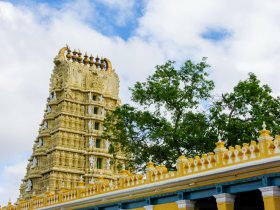 The various temples, palaces, lakes, and forts etc.Cosmopolitan Bengaluru is the number one city in the Indian deep south, blessed with a benevolent climate and a burgeoning drinking, dining and shopping scene. It’s not necessarily a place you come to be wowed by world-class sights (though it has some lovely parks and striking Victorian-era architecture), but instead to experience the new modern face of India.Bangalore city is now the nerve centre of industrial activity in the state with the presence of several Public Sector Undertakings. The Electronic City in Bommasandra and the Software Technology Park, called the IT Park, which has come up on the outskirts of the city, has earned the reputation of being the "Silicon" Valley of India. Many multinational and Indian companies are represented here. Ranked among the ten fastest growing cities in the world, Bangalore has many on-going and proposed projects in the industrial and Information Technology sectors. The city has slowly found a place in the country's history and off recently a place on the world map. Today Bangalore is India's fifth largest and the fastest growing city in Asia. The town served as the capital of the princely State of Mysore for nearly six centuries with distinguished rulers like Tipu Sultan and Hyder Ali. The city is also known as the cultural capital of Karnataka and is famous for its various temples, palaces, forts and old churches. The town is known for being the birthplace of various styles of Indian arts and crafts. Mysore is a major tourist destination in India and should be visited by all who want to experience the rich culture of this historical city. There is a touch of beauty in everything concerning Mysore, the Karnataka city. The city is one of the major tourist destinations in India thanks to its rich cultural heritage and historic importance. Magnificent palaces, stunning gardens, colourful festivals and exceptional craftsmanship are some of the special features that make Mysore unique and a much sought holiday destination.Its World Heritage–listed palace may be what brings most travellers here, but it’s also a thriving centre for the production of premium silk, sandalwood, and incense. These days ashtanga yoga is another drawcard, attracting visitors worldwide with its reputation as one of India’s best places to practice yoga. 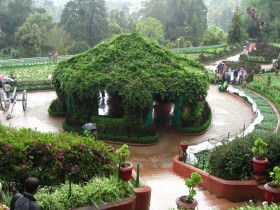 Ooty (Ootacamund) is one of the famous hill stations of Tamil Nadu. Ooty is surrounded by four majestic hills (Doddabetta, Snowdon, Elk Hill and Club Hill). These hills are part of the Nilgiri range which is a meeting point of the Ghats of India ( Western and Eastern). 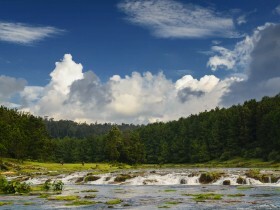 Known as the Queen of the hill stations, Ooty boasts of a climate close to the English summers. Ooty can get you a new high with the fresh smells of eucalyptus trees.Ooty is famous for vast spread of trees varying from pine, confers, tea plantations, coffee plantations across its expanse.Ooty is a very popular destination for movie stars( film shooting) and honeymooners alike.The flora of the range with its typical blue and lavender hues covers the Nilgiri range ( the Blue Mountains. Ooty may be a bit hectic and the town centre is messy, but it doesn't take long to get up into the quieter, greener areas where tall pines rise above what could almost be English country lanes. This botanical garden is one of the most beautiful botanical gardens you could find in India. Constructed by Haider Ali, it was later modified by Tipu Sultan. The Glass House in the gardens was inspired by the London Crystal Palace. Spread across a sprawling 240 acres of land, the garden has above 1800 species of plants, herbs, and trees. The lawn clock in the garden is the first of its kind in India.The Lalbagh Botanical Garden, Bangalore is of royal origin and was started initially as a private garden in an area of 40 acres by Hyder Ali, one of the most famous rulers of old Mysore in 1760. Initially designed in Mughal style, on the model of an extensive garden at Sira in Tumkur near Bangalore, this garden was further developed by Hyder Ali’s son Tipu Sultan and subsequently by the British and Indian doyens of horticulture by extension of area and addition of some plant species. 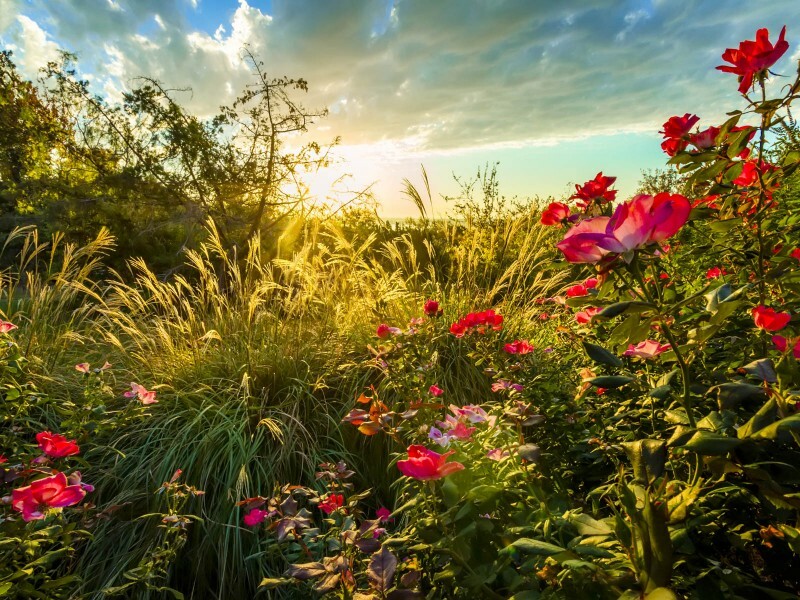 These gardens boast a rich collection of almost 1000 different species of flora. There is also a Glass House inside the gardens, modelled on London's Crystal Palace. 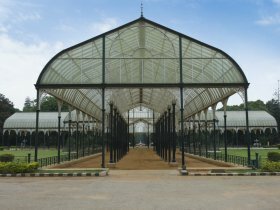 Spread over an area of 2400-acre, the Lalbagh Botanical Gardens hold the distinction of having the largest collection of rare and exotic plants in India. The first lawn clock of the country was also set up in these gardens only. The garden is beautifully designed, with lawns, flowerbeds, lotus pools and fountains adding to its splendour. Flower extravaganzas are held every year in the botanical gardens, as a part of the Independence Day and Republic Day celebrations. It was built in the year 1886. The museum houses rare collections, which represent various periods. The 18 galleries in the museum have antique jewellery, Neolithic finds various civilizations and so on. You will find amazing sculptures and old paintings here.Venkatappa Art Gallery and Government Museum have loads to offer to a curious mind. Know the life of early man through unique implements and tools, the Harappan antiques and so much more. It is one of the oldest in the country so you might want to spare some time from your vacation to discover something new from the pile of old. Situated within the museum is the Venkatappa Art Gallery. Get impressed--you don’t have another option when you see the classic paintings of K Venkatappa, the court painter of the Wodeyars. The 600 paintings capture the essence of gorgeous sun rises in Ooty, the captivating beauty of the Nilgiris and the Church Hill and other breathtaking natural wonders. There are some paintings of Hanumaiah as well. On the first floor, however, you can compare these with the more contemporary paintings of M F Hussain. Then there are art pieces from different schools like the Mathura and Khajuraho as well. You need only a single ticket for the Venkatappa Art Gallery and the Government Museum. 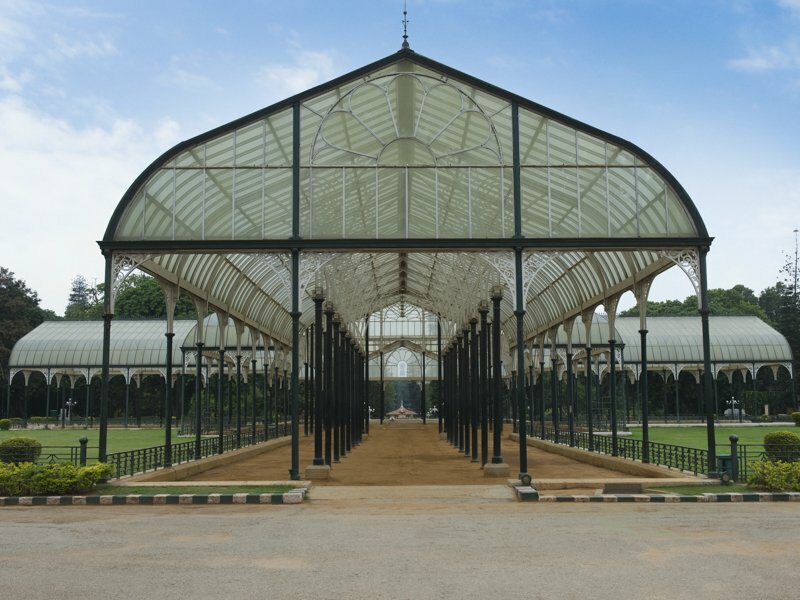 The Government Museum of Bangalore comprises of two exhibition floors, which have been further divided into eighteen galleries. These galleries comprise of different sections like geology, natural history, sculpture, art, and numismatics. The rich collection of the museum comprises of ancient coins and art, along with relics from the Indus valley civilization, especially Mohenjodaro, Halebid, and Vijayanagar. Many relics kept at the museum are as much as 5000 years old. Government Museum of Bangalore also houses prehistoric artefacts, belonging to the Neolithic period. These artefacts were unearthed while excavations were being carried out at Chandravalli. Other items displayed inside the museum include a rich assortment of South Indian jewellery, fascinating stones, inscriptions, icons, paintings, coins, miniature paintings, sculptures, textiles, etc. Government Museum is open on all days, except Wednesdays and public holidays. Bannerghatta Biological Park is located about 22 Kms south of Bengaluru city. It is one among the few places in the world where wilderness is preserved so close to a big city. It is having different units such as Zoo, Safari, Butterfly Park, and Rescue Center (Conservation of captive animals).A variety of animals are looked after here in this National park. The Mammals are left free in the forest, and the visitors are taken around the forest in a well-caged mini-bus to view these animals. Different partitions with huge gates and moats separate the forest into the Herbivores section and the Carnivores section. The Herbivores section comprises of few animals like deer, bears and a few monkeys etc. White Tigers, Lions, Bengal Tigers are covered in the Carnivores' section.The visitors are allowed to view the forest area only in the 'safari' (joy ride) buses and are not allowed to get off the bus whatsoever. The Bannerghatta National Park also boasts of a zoo where reptiles, birds, and amphibians are looked after in cages. Endangered animals like Cheetahs, Leopards, Hyenas, and Panthers are looked after here, in cages.There’s also a small museum and auditorium in the zoo. The BBP Office near the entry gate issues tickets for the zoo and safaris. The parking area lies near the entrance opposite the zoo. There are several soft drinks vendors near the entry point and kiosks (run by KSTDC) in the zoo precincts. The Herbivore enclosure (housing blackbuck, bison, cheetah, and sambar) is located to the right, a few kilometres past the zoo. About 11/2 km from the entry gate, close to the Herbivore enclosure, is the KSTDC run Jungle Lodges Nature Camp, where visitors can take up the lion and tiger safari packages (including night stays) on offer. Avalanche Lake is a valley that's much more than just beautiful with rolling meadows, swaying flowers, slow trickling streams and marine life that comes, literally, kicking out of the waters. It lies at some 26 km from Ooty and is a great draw for wanderers, loners and families alike. If walking amidst nature, trout fishing and trekking is your cup of tea; this is the place to beat.Trout fishing can be enjoyed in this lake by making use of the fishing rods and other important equipment. The Trout Farm near the Avalanche Dam is famous for trout fishes, which breeds in unpolluted water.Small waterfalls falling from the encircling mountains creates a picture-perfect ambience. The surrounding forests are so dense that even sunlight cannot penetrate through them. Surrounded by a vast species of rare trees, the Ooty botanical garden provides a lush environment for families to relax and a recreation area for children to play. The riot of colours found in the environment is a much-visited spot by nature lovers.The Ooty Botanical Gardens which teems with an amazing variety of flora is divided into six areas. These are the Lower Garden, New Garden, Italian Garden, Conservatory, Fountain Terrace, and Nurseries. The widely spread flower beds are also are an intrinsic part of the garden.Moreover, there are rare species of trees such as the cork tree, the paper bark tree, and 20 million-year-old fossilized tree. An Italian-style garden bordering a clear pool, a variety of flowering bushes in myriad hues and a fern house with a range of ferns and orchids are the other attractions of the garden.Furthermore, a flower show along with an exhibition of rare plant species is held every year in May. Visitors can shop for Tibetan clothes as a takeaway from the garden. Hedged by beautiful trees, the Ooty Lake is this town’s most famous and lively tourist spot. The lake itself is a pleasing body of water surrounded by thick foliage.There’s a large area at the entrance with flowers, snacks, and toy-sellers. Boating is the prime activity of the lake.The lake is large enough for one to be able to get away from crowds. Surrounded by tall Eucalyptus trees, the lake is a serene location, with the waters coming in from different streams that run by the hills.Initially, the water from the Ooty Lake was dammed to form the lake. Gradually the lake had shrunk in size giving place to the present racecourse; the bus stands as well as a mini garden. The Pykara Lake is a placid lake located between the lush green valleys of Ooty. This lake is surrounded by dense forests.The river falls from two different heights at the end, one at 55 meters and the other at 61 meters. These are known as the Pykara falls and are located at a distance of 1.5 km from the lake.A forest rest house is located in the area. Additionally, Pykara is also known for its boathouse. The boathouse is inclusive of a restaurant and a rest house.The Pykara Lake has been found to be clean and free from pollution; furthermore, it is not crowded through the year. The surrounding local forests known as sholas add to its natural beauty.Boating is a key attraction of this the Pykara lake and tourists can enjoy it at a reasonable price. Chamundi Hills is 1065 meters above the sea level. It is just 3 km from Mysore. The Chamundeshwari temple on top of the hill belongs to 11th century.Halfway up the hill, you will find an idol of a bull called Nandi. The speciality of the 5-meter tall statue is that it was sculptured out of a single rock in 1659. You need to climb 1000 steps to reach the Chamundeshwari temple.An energetic visitor will be well repaid by climbing up the 1000 steps, fashioned about 300 years ago, and a good motorable road leads to the top of the hill. The largest and the best known is the large Dravidian Temple, dedicates to Sri Chamundeshwari Devi, the tutelary deity of Mysuru and here royal house, generally regarded as an incarnation of Parvati or Durga.Chamundi Hills is the prime landmark of Mysore city, visible almost from anywhere in the city centre. The hill has a very close association with the founding of the city. In fact, the very name of Mysore is associated with the hill.Chamundi Hills has an important place in the history of Mysore. The oldest temple in Mysore, the Mahabaleshwara temple is located atop the Chamundi Hills. So is the oldest inscription found in Mysore? 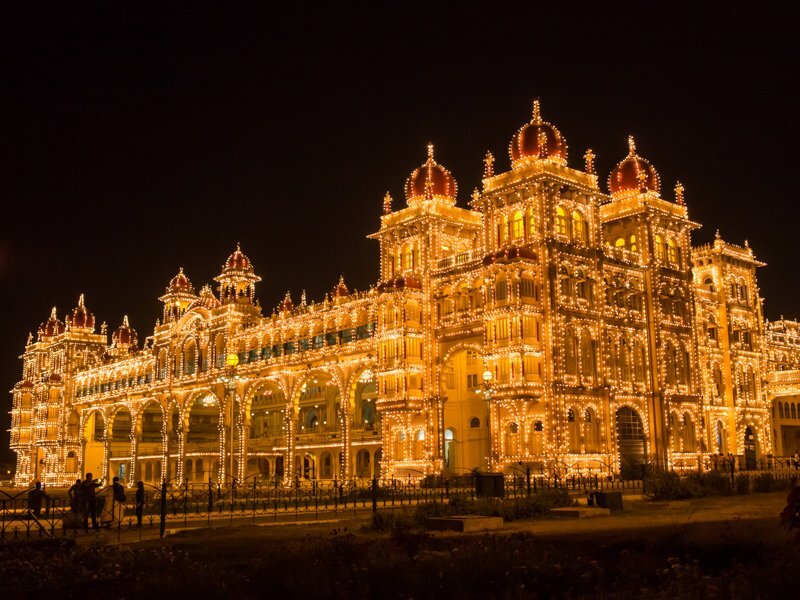 Mysore Palace, also known as Mysore Maharaja Palace is one among the largest palaces in India. It is situated in the city’s centre. The palace was built in the year 1897 using wood, which was damaged due to fire. It was later reconstructed in the year 1912. The architecture is a blend of Hindu, Islam, Gothic and Rajput styles. The stunning interior is a display of intricate craftsmanship. 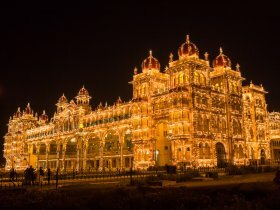 Also known as ‘Amba Vilas Palace’, Mysore Palace is located in the heart of Mysore and is the official residence of the Wodeyars (erstwhile royal family of Mysore). This remarkable palace is one of the most famous tourist attractions in India, second only to the enchanting Taj Mahal (Agra). The architecture of the palace is an amalgamation of Muslim, Rajput, Hindu and Gothic styles of architecture. This three-storeyed stone structure is surrounded by a vast expanse of well-manicured and lush gardens. The beautiful building was designed by Henry Irwin, using fine grey granite and deep pink marble (for domes). The Mysore Palace houses many exquisite carvings and works of art from all over the world, and thus, has been converted into a museum for public viewing. The interior of this Indo-Saracenic marvel – a kaleidoscope of stained glass, mirrors and gaudy colours – is lavish and undoubtedly over the top. The decor is further embellished by carved wooden doors, mosaic floors and a series of paintings depicting life in Mysore during the Edwardian Raj era. Mysore Zoo also known as Shri Chamarajendra Zoological Gardens offers a wonderful experience. This is one of the oldest zoos in India having been constructed in 1892. The Zoo is spread in a sprawling 250 acres of land and houses a stunning range of species. It might interest you to know that the zoo not only contains animals of our country, but it also houses animals from around the world.The various animals that are exhibited in the zoological gardens of Mysore are provided with large, spacious and open enclosures. This enables them to have the feeling of remaining close to nature. Many mammals, reptiles, and birds are exhibited at this zoo.The Zoo has about 1500 animals, ranging from the opossum to orangutan. This Zoo houses a wide range of animals. Mysuru Zoo was the first in the country to obtain gorilla and penguins. Many animals which are imported from countries like Africa, America, and Australian countries under conservation project due to the successful breeding of the white tiger. It is also credited with achieving considerable break-through in captive breeding of many animals. Elephants also breed well in captivity in this Zoo.The Zoo has a small museum which exhibits the stuffed animals. A small library is also located in the Zoo. Painting and essay competitions are periodically conducted by the zoo authority the children to create awareness and love in them for animals.